More about iittala Toikka Mirella 2012 Annual Egg According to Professor Oiva Toikka, black and white are colors of “good taste”. . Adorned in black and white, the Annual Egg, 2012 Mirella's Egg is awash is horizontal and vertical stripes of black and white moving all across the tall and spherical egg. A black glass band is rotated around a clear glass bubble infused with white powder to achieve the egg’s plaid effect. Because of this color combination, parts of the egg gleam blue. Matching the 2012 Mirella Bird, the egg can be displayed on its own, or in its set. After cooling, the eggis etched O.Toikka Nuutajärvi and given its individual number out of 750, a mark made to ensure its authenticity. As a part of the 2012 collection, the Mirella Egg celebrates 40 years of innovative and stylish Oiva Toikka birds. The 2012 collection of birds by Oiva Toikka are individually mouth-blown by the master glassblowers at iittala’s glassworks in Nuutajärvi, Finland. 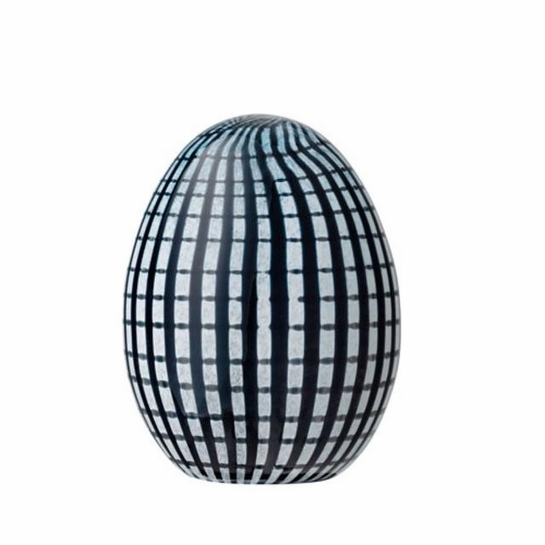 Each handcrafted iittala Toikka Annual Mirella Egg carries the etched signature “O. Toikka Nuutajärvi” on its base to ensure its authenticity.